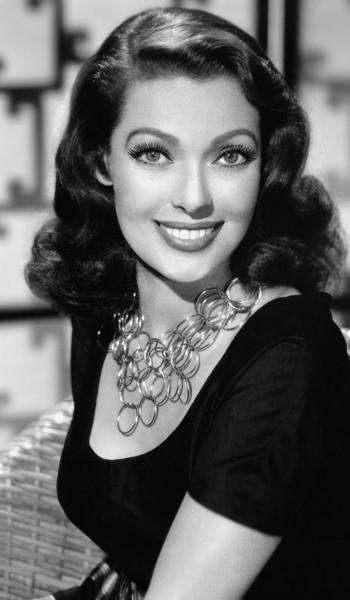 Loretta Young, The Oblong Face. Long narrow face with hollow cheeks. Don't dress your hair high on your head. Don't bring rouge in too close to your nose or far out on the sides of the face. Don't arch your eyebrows too high. Don't use eye shadow if you have deep-set eyes. Don't widen your mouth too much or attempt a cupid's bow. Do get width into your face by fluffing hair at the sides of the face, or full behind the ears. Do use your natural eyebrow line and do not extend it. Do make your lower lip full at the corners with your lipstick. Alice Faye, The Triangle Face. Narrow forehead, wide jaw and chin line. Don't cover the forehead with even a suggestion of bangs. Don't use heavy rouge. Don't use a straight line for your eyebrows, or carry eyebrow line too far out on the temple. Don't arch the upper lip above its natural outline. Do brush the hair back from the temples to create the illusion of width in the forehead. Do apply rouge in a modified triangle shading to the temple and under the center of the jawline. Do arch your eyebrows only slightly. Do create a natural-looking wide mouth to reduce the apparent width of the jawline. Geraldine Fitzgerald, The Inverted Triangle Face. Wide forehead, narrow chin line. Don't draw the hair back tightly or too snugly above the ears. Don't carry your rouge down the jawline or too far toward the center of the lower cheek. Don't raise the eyebrows or extend them or use an angular eyebrow. don't use a wide mouth or make the lower lip too square. Do dress your hair in an easy effect on top, beginning the fullness at a point above the ears. do place your rouge on the highest point of the cheekbone. Do keep your eyebrows natural and not thin. Do arch your mouth slightly, but don't widen the corners.